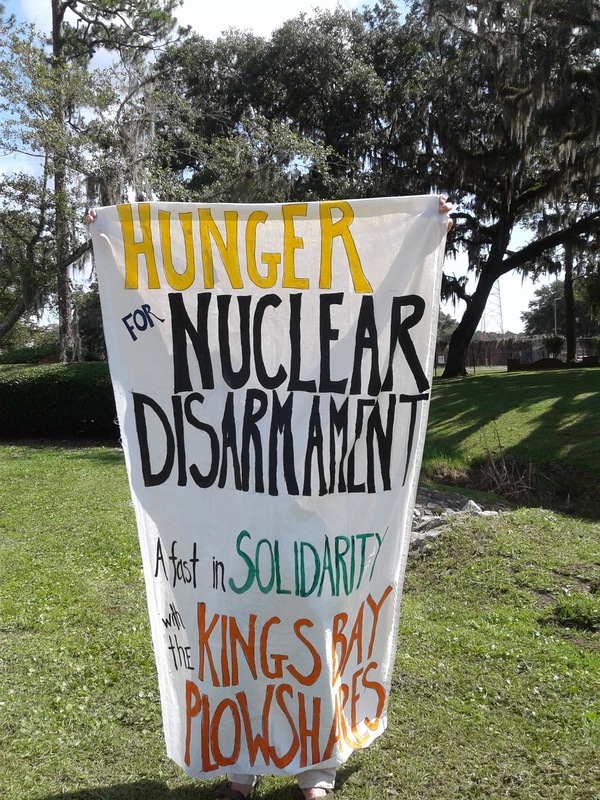 Banner held outside of the Trident nuclear submarine base, Kings Bay, GA. Photo by Beth Brockman. In the state of Georgia’s Glynn County Detention Center, four activists await trial stemming from their nonviolent action, on April 4, 2018, at the Naval Submarine Base, Kings Bay. In all, seven Catholic plowshares activists acted that day, aiming to make real the prophet Isaiah’s command to “beat swords into plowshares.” The Kings Bay is home port to six nuclear armed Trident ballistic missile submarines with the combined explosive power of over 9000 Hiroshima bombs. 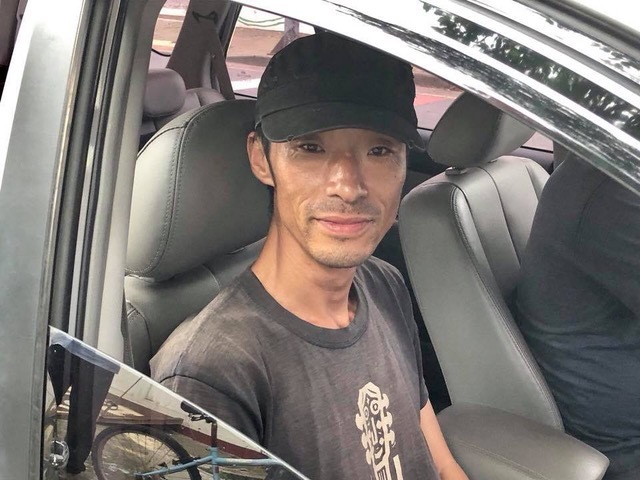 On June 4, Korean peace activist Park Geun-gil entered the Jeju Prison to serve time instead of paying a fine of 4.6 million KRW (around US$4,000). At the rate of 100,000 KRW/day, he will serve 46 days and should be released by July 20. [Update: He was released from jail on June 14 after an anonymous person paid his fines.] Park, who is known as Mangi, joined a demonstration in December, 2015, protesting police brutality the day before in the arrest of a human chain blocking construction of military housing for the long-resisted navy base at Gangjeong village. Mangi was convicted of obstructing justice and injuring a policeman, although it was Mangi’s finger that was fractured by twisting as he was arrested. His conviction was upheld in July, 2017. To read more about the Peace Island of Jeju and the struggle against the new naval base there, visit savejejunow.org. The Poor People’s Campaign: A National Call for Moral Revival launched the day after Mother’s Day with rallies and nonviolent civil disobedience at more than 30 state capitals across the the United States. The Campaign revives the vision of Dr. Martin Luther King, Jr.’s 1968 Poor People’s Campaign that challenged the fundamental and interconnected injustices of racism, poverty and war. To these triple evils, as King identified them, the 50th anniversary campaign has added ecological devastation as part of the common threat to humanity. The organizing model for this, the first phase of the Campaign, is a series of six weekly rallies and civil disobedience actions, each highlighting facets of the Call. 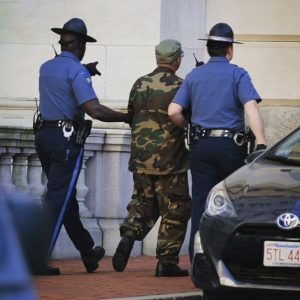 Phase One will wind up on Saturday, June 23 with a “Global Day of Solidarity and Sending Forth Call to Action Mass Rally” in Washington, D.C.
After the first three weeks of action, chronicled below are reports of over 1,000 arrests reported from 24 states and the District of Columbia. * Each week some civil disobedience actions did not result in arrests. The largest number of arrests were reported during the May 14 action in Washington, D.C. when demonstrators occupied First Street outside the Capitol building and refused to leave. One hundred and forty-six people were cited and released.